How to use flash cards to help learning vocabulary. Buy a set of blank white cards. Business cards (les cartes de visite) are a good size. Or, cut small cards out of a piece of poster board. Normal paper is acceptable but not as good. 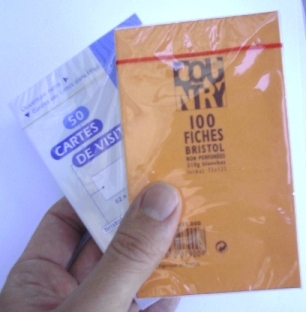 In French they are called fiches bristoles or cartes de visite. They are sold by packets of 50 or 100 and can be either plain white or with lines on them. Reasonable sizes are either 125 x 75mm or 128 x 82mm. If you buy bigger ones, you can cut them in half to get twice the number. Make sure that they are thick enough - over 200g is best. Keep them in a little package, box, or ringed binder so that you don't lose them. Otherwise an elastic band works well. On the front of each card, write one vocabulary word which needs to be learned. Go through the deck of cards in order one by one, turning each one over to learn the definitions. After going through the deck several times, try to say the definition before turning the card over. Little by little, certain vocabulary words will become easy. Once you know a word on a flash card, put that card down in a separate pile. Soon, the number of cards in your hand will diminish until you know all the vocabulary words. Pick up the pile the next day and see if you still remember all the words. Shuffle the cards to see if you know the words out of order. Turn the whole deck over and try saying what the vocabulary word is when you can only see the definition. Ask a friend or a family member to read out the words and ask you to give them a definition. Or ask them to read the definition and have them ask you to give the word and its correct spelling. Be sure the card material is thick enough and opaque enough so that you cannot see what is written on the other side! Start with 10 to 20 cards. Do not try to learn a pile of 150 cards in one day! You will quickly become discouraged if you attempt too many at one time. Small cards can fit in your pocket and you can go through them any time - you do not always have to be sitting at your desk to be learning. It is much more effective to go through the flash cards for 10 minutes once or twice a day rather than going through them for 2 hours in one evening. Why? Because your brain needs time to put things in order and because repeating something many times sends a message to your brain saying "Hey! This must be important!". You do not have to wait to start making your cards at home. You could have blank cards with you in class and as we are taking notes, you could be writing down the new vocabulary words and their definitions on the back. I personally used flash cards a lot when I was a student. My history teacher in 6th grade (6ème) taught me how to make them. I used them to learn French vocabulary, Latin vocabulary, the U.S. states and their capitals, and even the notes to read sheet music.